OP3192. 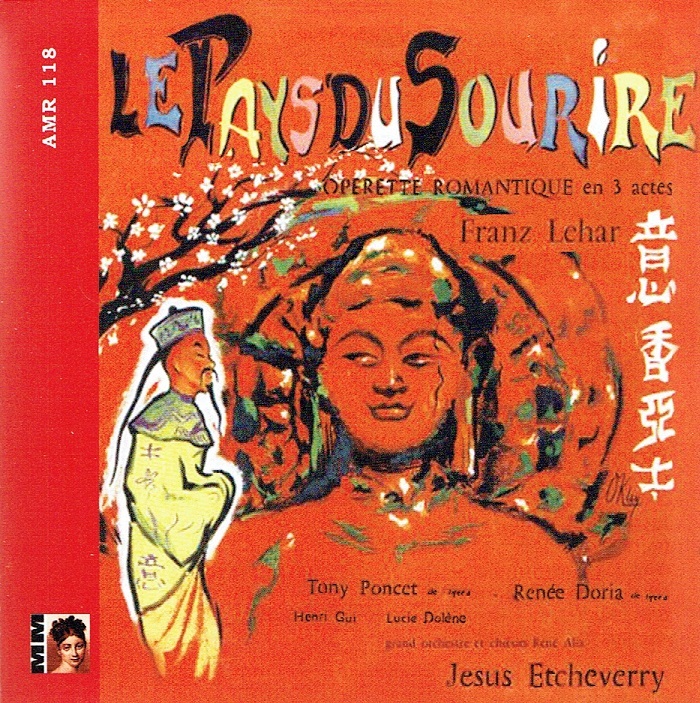 LE PAYS DE SOURIRE (DAS LAND DES LACHELNS) - Excerpts (in French) (Lehar), recorded 1957, w.Etcheverry Cond. 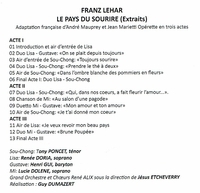 Tony Poncet, Renée Doria, Henri Gui & Lucie Dolene. (France) Malibran AMR 118. [AMR titles are issued without rear tray-cards] Final Copy! “Vezzani clearly had the better and more pure style and Luccioni the more sensuous sound and more metal, but it was Poncet (The Last of the French ‘fort ténors’) who kept those Meyerbeer operas in the repertoire at a time when so called serious critics and managers thought them old trash. Lucky for us in the eighties some singers realized what a gap of operatic history was disappearing (and what possibilities for success) and though not common, a lot of revivals have proven these operas to be a treasure trove. But none of the tenors after Poncet (surely not in France) were able to step into his vocal shoes as most of them were spintos at their best. Tony Poncet was indeed the last ‘fort-ténor’. He started with a concert in Lyon, France’s second city, in January 1953. A few days later he made his official opera début at the municipal theatre of Avignon. It must have been quite an occasion for Poncet, as he had to sing the roles of Turiddu and Canio at the same time, no mean feat. In June 1956, he had an audition before Georges Hirsch, the general manager of the two Paris Opera Theatres. Hirsch realized Poncet’s potential and helped him improve his musical and scenic abilities. He understood the problems of Poncet’s height and decided that lack of centimetres can be an asset when singing Canio, a poor clown and a cuckolded husband. In January 1957 Poncet made his début at the Opéra-Comique and scored a triumph. A serious critic like Roland Mancini tells us that one of the two most intense ovations he ever heard at a début at the theatre belongs to the tenor (Robert Massard got the other one in IL BARBIERE). Then Poncet made his début at the Opéra itself in the one aria-role of DER ROSENKAVALIER, an opera where it is plausible that the Marschallin has all kind of strange looking servants and so a very small tenor can fit easily in. Poncet was more than ably partnered by some of France’s best singers like Andrea Guiot, Gabriel Bacquier, Jean Borthayre at the Comique and Crespin at the Opéra. From 1958 on he no longer had to look for performances as theatres realized his talents and his fast growing popularity due to his first recordings. Philips France recorded him at the end of 1957 in a long French selection of Lehar’s DAS LAND DES LÄCHELNS together with soprano Renée Doria. The operetta always was a hit in France and all important tenors and high baritones recorded it (Luccioni, Vanzo, Botiaux, Dens etc). The recording was a huge success. This is already vintage Poncet as we will get to know him in his subsequent recorded and some live performances. The voice sounds huge (and it was huge). It is dark-hued as Spanish tenor voices often are and the timbre is not conventionally beautiful. Some people will even think the timbre somewhat ugly as it is grainy timbered but those are the ones that will not like a voice as Pertile either. But Poncet doesn’t chop up his phrases; he has legato and can sing mezza-voce though piano is not his forte. Anyway the record told French tenor buffs that at last here was a successor of Affre, Granal, Verdières, Luccioni and Vezzani. Always generous to a fault, he helped Toulon out on the 21st of December 1958 when their announced tenor fell ill. He sang Canio at the matinee and in the evening he appeared as Rodolfo. “Renée Doria’s official operatic début took place in 1942, in Marseille, as Rosina in IL BARBIERE DI SIVIGLIA. After singing Constance in THE ABDUCTION FROM THE SERAGLIO in Cannes under Reynaldo Hahn, and the three heroines (Olympia, Giulietta, Antonia) in LES CONTES D'HOFFMANN in Strasbourg, opposite baritone Vanni Marcoux, she made her Paris début at the Gaîté-Lyrique in 1943, as Lakmé, and the following year, made her début at the Opéra-Comique, in the same rôle. Her début at the Paris Opéra in 1947, as the Queen of the Night in THE MAGIC FLUTE, was highly successful. 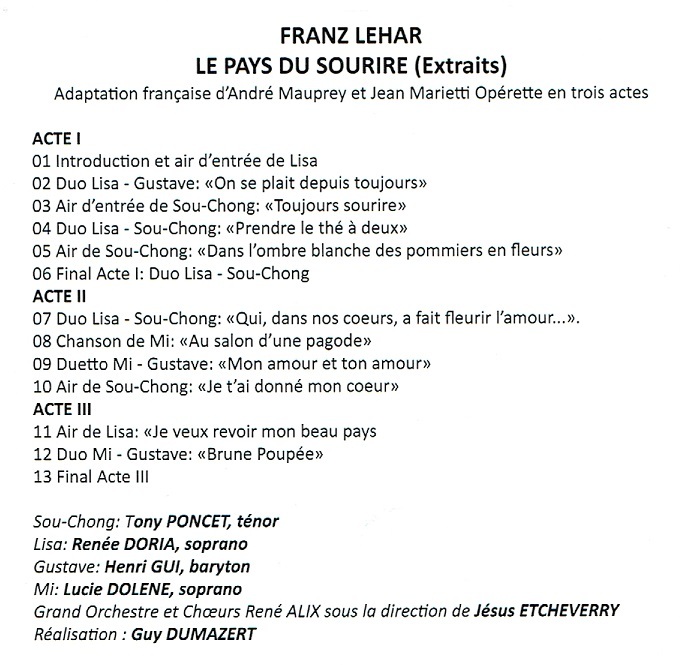 Other rôles at that house included Leila in LES PÊCHEURS DE PERLES, the title rôle in MIREILLE, Marguérite in FAUST, Juliette in ROMÉO ET JULIETTE, Ophélie in HAMLET, Manon, Thaïs, as well as Fiordiligi in COSÌ FAN TUTTE, Gilda in RIGOLETTO, and Violetta in LA TRAVIATA, etc. Doria also sang in baroque music such as Rameau's LES INDES GALANTES, and contemporary works, such as Ravel's L'HEURE ESPAGNOLE, and Poulenc's DIALOGUES DES CARMÉLITES. In her thirty year career, Doria sang an estimated sixty rôles."